While much of the country eagerly awaited the arrival of the film "Pearl Harbor" as possibly the first blockbuster of the summer, some of Japanese ancestry worried. "We know there are some people who will leave the movie and want to fight World War II all over again," says John Tateishi, the national director of the 24,000-member Japanese American Citizens League. As the country's largest Asian American civil-rights organization, the JACL is worried that Disney's $140 million film will stir up resentment toward Japanese Americans and the Asian American community at large. "There will always be people who continue to see us as foreigners, as the enemy. There will always be people who point their finger at us because they are upset with the actions of foreign nations such as Japan and China," Tateishi said. Director Michael Bay says about the real events behind his latest film "Pearl Harbor," "... it happened." The director of "Armageddon," and "The Rock" isn't only referring to the Japanese attack some six decades ago but some of the specifics depicted in the film that illustrate war's brutality. extraordinary things by conviction, not by choice." But Bay points out that the film, which opens today in 3,200 theaters nationwide, also shows an honorable and merciful side of the attackers. He said he feels comfortable that "the Japanese in this film are treated with dignity, perspective and accuracy," he said. But the Japanese American Citizens League, the country's largest Asian American civil-rights organization, is worried that Disney's $140 million film will stir up resentment towards Japanese Americans and the Asian American community at large. The JACL says "Pearl Harbor" mainly features Asian actors as members of the attacking Japanese forces. Few Asian American faces are among those aiding the American war effort or are depicted as Hawaii residents, although Japanese accounted for 40 percent of the 423,000 population according to the 1940 U.S. Census. Filipinos comprised 15 percent of the population and Chinese percent. The film does show one U.S. military doctor of Asian descent assisting victims of the attack. Asked about the lack of Asians in the film on the American side, Peter Schneider, president of Disney's Touchstone, said: "I have no answer for that." 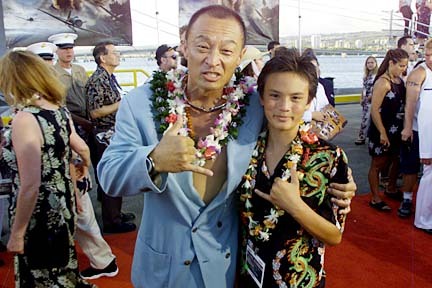 Kauai resident Cary-Hiroyuki Tagawa, who portrays Japanese Cmdr. Minoru Genda, believes "Pearl Harbor" "fair and accurate" in its portrayal of the Japanese military but could still cause raise racist sentiments from those "already leaning that way." "The potential is there, but the ones who would be incited would need much less than a movie about Pearl Harbor to get inspired," he said. "This film will not be that turning point." 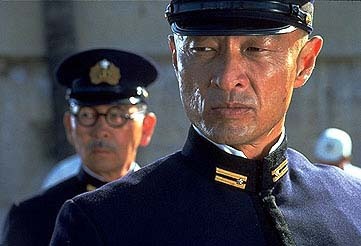 Tagawa initially was concerned that the director of "Armageddon" and "The Rock" wouldn't treat the attack sensitively and honesty. "The Japanese were treated admirably and true to character," Tagawa said. " 'Pearl Harbor' is really an anti-war statement about men killing men, men on both sides who believed in what they were doing, the sacrifices of ordinary men who have to do these extraordinary things by conviction, not by choice." 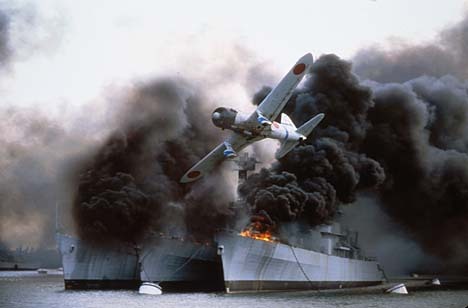 Tagawa points out that the film includes a scene of the Japanese pilots preparing for the attack in traditional religious ceremonies and later Adm. Isoroku Yamamoto's reluctance, even sadness, in initiating the attack. Tagawa, a U.S. Army brat, was born in Tokyo. His father was in the U.S. army and in Hawaii when the Pearl Harbor attack occurred. His mother was an actress from Tokyo who was in Japan throughout the war. aboard the USS John C. Stennis. "I remember well what it was like to be a Japanese-American living in places like Texas, Lousiana and North Carolina, where bathrooms were designed "White" and "Colored," Tagawa said. "I had to deal at a young age with the legacy and infamy of being a Japenese; Dec. 7 was not my favorite holiday." The 40-plus minute "Pearl Harbor" attack may be the most horrific and lengthy war action footage Hollywood has produced. There are scenes of men asleep in their bunks as bombs destroy their ships, killing them instantly; sailors trapped in a capsized ship flooding and drowning them; men clinging to a hull screaming they can't swim; sailors swimming from burning oil in the middle of Pearl Harbor being strafed by Japanese planes. In one scene the men dive to the shallow bottom clinging to coral heads to escape the bullets. Some men are still hit and killed. Bay's directing seems to focus on the horrors of war rather than the Japanese brutality. "It all happened," Bay told the Star-Bulletin. "Nothing was our creation. "To be accurate, to capture the terror, the utter chaos, you have to show honestly what the Japanese did. I think we did it fairly and didn't overdo it." Bay gave several examples: Near the beginning of the assault on Pearl Harbor, a co-pilot in a low flying Japanese plane waves off children playing baseball in a field. A close up of the co-pilot's face clearly shows him yelling for them to get away. In an earlier scene, a Honolulu Japanese dentist receives a telephone call at his office from someone asking him about the number of U.S. Navy ships docked in Pearl Harbor. When the dentist hangs up the phone, he tells his assistant "That was a strange call," making it clear the physician is no spy or sympathizer. Bay said he and screenwriter Randall Wallace met several times with Pearl Harbor survivors, service people stationed on Oahu at the time of the attack, and World War II historians for accuracy about the events. "I had (attack) veterans in San Diego tell me how when their ship sunk and they couldn't swim in some areas because of the fire that the Japanese Zeroes had nothing left to bomb, so they dropped low to shoot the guys in the water," Bay said. "I wanted to show that this was a war without guns because once your ship is sunk you're sunk. That scene is probably as harsh as we get with the Japanese." If the production had soft peddled the Dec. 7, 1941 attack, Bay said he would have been criticized for being too politically correct. "And I am definitely not that," he said. Meanwhile, a Disney source says some dialogue has been changed to avoid offending audiences when the film debuts in Japan (July 14) and Germany (June 7). The official described the changes as "a few, slight modifications ... words that would be culturally insensitive to the country where the film is playing have been altered or deleted." In an interview last week the film's producer Jerry Bruckheimer told the Star-Bulletin one change was a shot of the date -- Dec. 7, 1941 -- that was replaced with Dec. 8, 1941, since when the attack occurred on Pearl Harbor it was already the next day in Japan. Disney's overseas advertising campaign will play up the love story and downplay the battle, he said. The most used poster in the international market will be of Kate Beckinsale and Ben Affleck embracing. Also, a closing speech by Kate Beckinsale has been altered for all international versions of the film. Instead of closing the film with Beckinsale saying "World War II changed the course of history for us," the new version changes "us" to "Americans."